While some schools are spinning their wheels in long practiced yet outdated approaches, community engagement among the educational village can offer far more than parent teacher interviews and a once a year fete. Modern technology, changing social demographics, emerging health challenges and shifting employment practices are all key to understanding the emerging landscape for schools in community engagement. By understanding these changes, we can springboard our learning environments beyond classes and schools towards the collaborative village of learning? Ideally our educational communities include more than just the students and their teacher. They involve the parents, grandparents, siblings, neighbours, friends, alumni and other partners working together towards the good of the whole school village. This village ideal has evolved and diversified over time. To enable broader belonging, we need to embrace the breadth of people, personalities, skills, interests and passions that our community village may offer. Creating opportunities for broader educational benefit doesn’t just happen, it takes deliberate consideration and culture change stretching us beyond previously held paradigms and 20th century ideas. The Australian educational future needs to be prepared to explore innovative ideas towards better outcomes for the whole village, not just a great ATAR score. Innovation in education lies in a rethink of community engagement practice and new avenues of relationship building purposed towards sharing and building capacity in the collaborative educational village. Exciting new examples are starting to emerge. Examples from the classroom, the playground, the local beach, the village center and across the globe, show a reimagined approach in practice, describing an account of a broader, practice oriented vision of education. This educational vision shows new partners and brilliantly energizing synergies that captivate students, teachers and others in the learning and community building process of education. 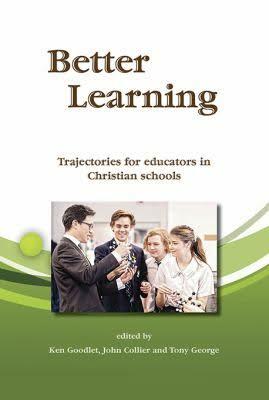 Jenny George has written a chapter titled “Community Engagement in Schools” in the recently published book Better Learning, edited by Goodlet K, Collier J and George T (2017). It is available through St Marks Publishing, Canberra.